It was about 85 degrees that day, so I wanted to make something fun, summery and refreshing. (And also something that started with "T" so I could post it on the blog). 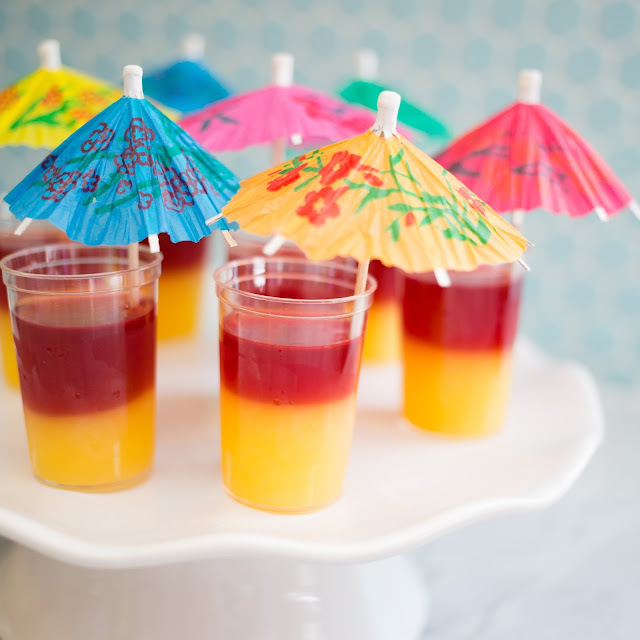 Enter these Tequila Sunrise Jello Shots, complete with multi-functional drink umbrellas. It's basically summer all wrapped up into a miniature, disposable shot glass. The ingredients for these are super simple. All you need is: orange juice, tequila, grenadine and unflavored gelatin. (Well, AND cute drink umbrellas). 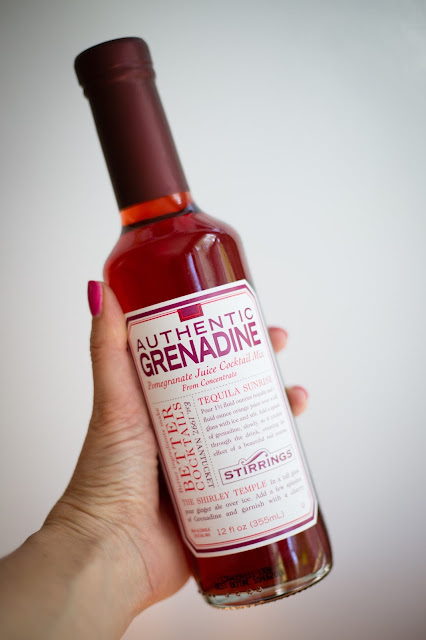 I considered making my own grenadine since most of the commercial stuff is full of high fructose corn syrup. But I was feeling lazy AND found this awesome stuff at Whole Foods. It's made by the Stirrings brand and it doesn't use any of the artificial stuff. Done and done. Make the orange/tequila layer, let it set in the fridge for about 30 minutes or so, and then pour in the grenadine layer on top. I was going for sort of a half-melted effect, so I poured in the red layer when it was still warm so it would partially melt the orange layer and mix together. I didn't *quite* achieve the effect I was going for, but they still turned out great! Let them fully set for a couple more hours (or overnight). When ready to serve, garnish with a cocktail umbrella, which not only looks adorable but also serves a useful purpose: helping to dislodge the shots from the cups! Cheers to summer and many more Backyard Olympics events! Pour orange juice into a small sauce pan. Sprinkle 1.5 packets (3 teaspoons) of unflavored gelatin over the top. Allow it to soak in a minute or two. Heat on medium, stirring constantly until gelatin dissolves. Remove from heat and stir in tequila. Place shot glasses on a sheet pan and evenly distribute the orange mixture among the 20 shot glasses (fill about half to 3/4 of the way full). Place in refrigerator and allow to lightly set, about 30-45 minutes. (Until they are no longer liquidy). While orange layer sets, make red layer. Pour half a cup of the grenadine in the saucepan and sprinkle with the remaining half packet (1 teaspoon) of unflavored gelatin. Allow it to soak in a minute or two. Heat on medium, stirring constantly, until gelatin dissolves. Stir in the remaining half cup of grenadine. Once orange layer has lightly set, pour the slightly warm grenadine mixture over the top. Return to refrigerator and allow to fully set, about 2 hours (or overnight). When ready to serve, insert drink umbrellas in the side of the glass. Great recipe! Big hit with my kickball team! How many oz are the shot glasses used for these? I believe these were 1.5 ounce glasses!